As far as Instagram influencers go, Caroline Calloway is no stranger to things melting down. She made a name for herself back in 2015 with an Instagram account devoted to writing her memoir, in real time, via captions. 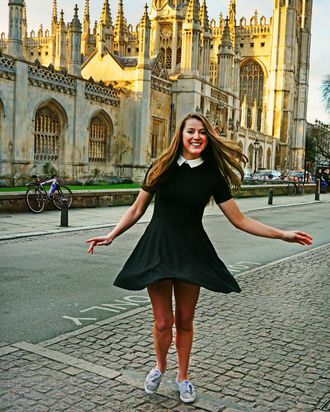 The account chronicled her romance at Cambridge with a guy named Oscar and ultimately landed her a book deal with an advance worth over $100,000. She made an even bigger name for herself when word got out the book wasn’t happening and she needed to repay said $100,000 — money which Calloway had already spent. Now, Calloway’s Instagram account is devoted solely to using the Stories feature. (Her most recent post is from 2017. The second most recent is from 2016.) That’s where Calloway excitedly announced in December that she was launching a “tour,” leading seminars to teach people how to be their best selves. Reader it, uh, did not end well. Scammer has almost sold out a majority of her $165 "creativity workshop" tickets but wants to hire two people to document it all unpaid. Oh, but it will be a trade of creative labour! Among the promised swag, Calloway said seminar attendees would go home with mason jar gardens. She ordered 1,200 jars and had them delivered to her apartment in New York City. Then she promptly began complaining that she had no room to store 1,200 jars. Calloway hosted the first of her seminars in Brooklyn over the weekend at a loft space. She loved it so much that she then asked her fans who bought tickets in Boston and Philadelphia if they would be okay with traveling to New York for their seminars. She asked this question in an Instagram poll where both answer options were some version of “yes.” “No” wasn’t a choice. Against the odds, and inclement weather, Calloway’s event in D.C. also went off over the weekend. “There wasn’t an orchid crown! Just a single flower to put in our hair that we didn’t keep. Mason jar had a little pack of wildflower seeds,” wrote an attendee in an AMA on Reddit, saying Calloway told the participants something like “orchids are really expensive, so instead of making a crown, that you honestly probably won’t wear outside of here, we’re just going to put flowers in our hair.” The mason jar gardens were just jars containing some seeds. “‘No notes, no flower crowns, only about 1.5 hours (max) of actual ‘teaching’ if you can even call it that. Icing on the cake? Her ‘staff’ are 20 year old college girls w no event planning/logistics experience that are just huge fans of her,” another attendee DM’d Donaldson. The salad, in Calloway’s defense, was apparently “damn good.” “Kale, arugula maybe, some other lettuce combo (lol), sautéed eggplant, hummus, and this homemade tangy vegan caesar dressing,” the same attendee wrote in their AMA. After D.C., Calloway — likely a result of seeing Donaldson’s now-viral Twitter thread — announced she was canceling the rest of the seminar dates and offering refunds. She also said she’ll be refunding anyone who attended the event in D.C. or New York. And just like that, the Creativity Workshop by Caroline Calloway ascended into failed influencer-event heaven. I imagine the ghost of Fyre Festival met it at the gates. You can read the entire thread from Kayleigh Donaldson here.